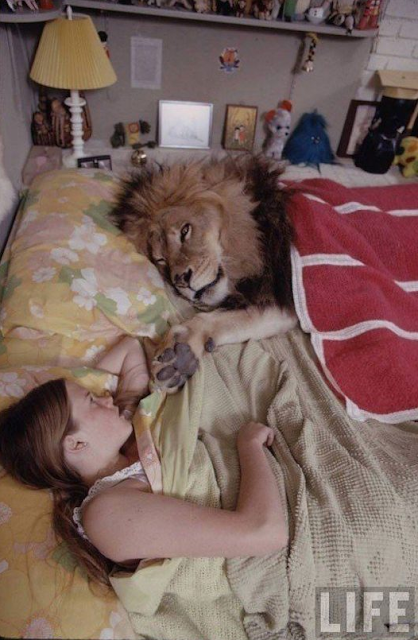 Young Melanie Griffith (Tippi's daughter) enjoys a slumber party with Neil the Live-In Lion. Pillow fight! I don't usually post pictures of cats on the Internet. However, I'm willing to make an exception for Hitchcock-Blonde-turned-Hitchcock-Hater Tippi Hedren, who runs a non-profit that provides sanctuary for lions and tigers. For over 40 years, she has lived among them, making her home right on the preserve. I think it's a good idea to post these pictures--and the story behind them. Why? 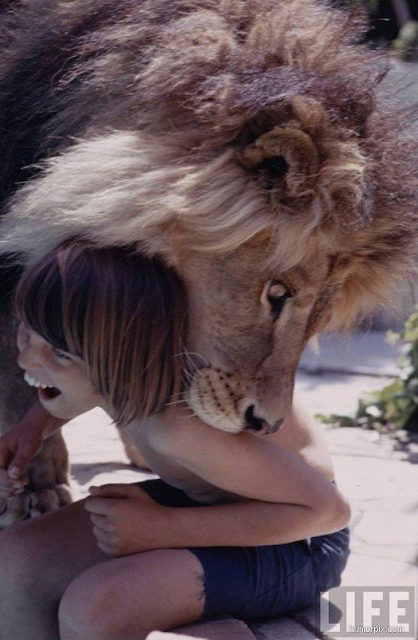 AG: There’s a photo of you and a teenage Melanie, whose head is six inches away from Neil, your first live-in lion. TH: He was not a live-in lion. Sometimes I get so annoyed with you writers. TH: O.K., I missed that one. O.K. At 82, Hedren could be forgiven for forgetting. But this isn't merely a senior "Oopsie!" moment. Hedren tried to elide at least ten years of her life, about which she wrote an entire book. 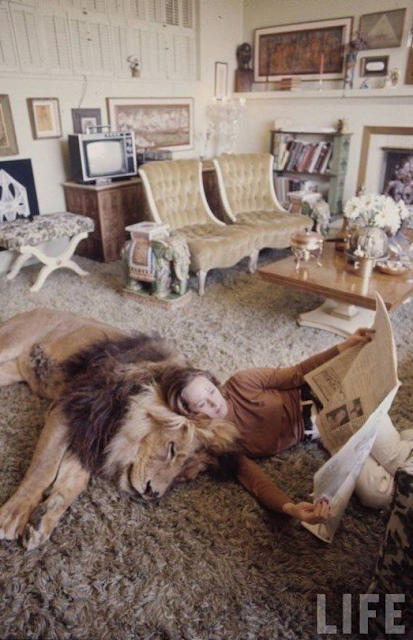 The book Goldman is referring to, The Cats of Shambala, was written by Hedren herself, and proclaims on its dust jacket: "Over a hundred photos bring the big cats, and the humans who worked, lived, raised them from cubs and (sometimes) slept with them, vividly to life." 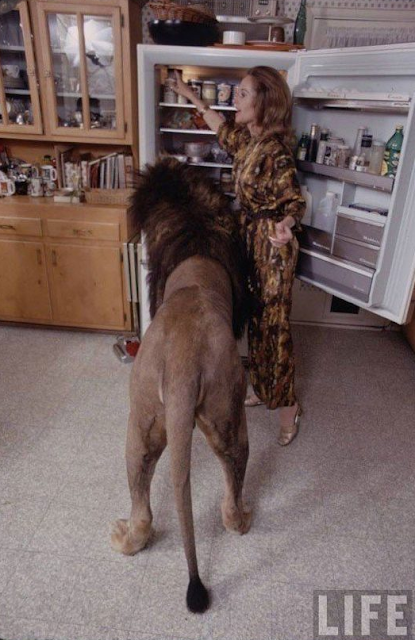 The lions were first brought in to live in her home in 1971 as cubs, in preparation for Roar! a film that she co-produced with her then-husband Noel Marshall and in which both starred. Soon enough, however that number grew much higher. 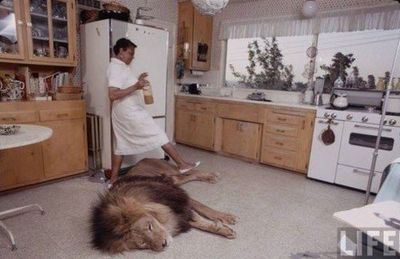 Inevitably, like Mrs. Bates, one of the big cats would go a little crazy sometimes. Hedren was attacked by a lioness who chewed off part of her scalp. Her stepson, John, was likewise scalped. Neil was mauled. Melanie was so badly scratched the wound required plastic surgery. The Hedren-Marshall clan became familiar with the local hospital staff the way other families get to know their local Baskin-Robbins. Luckily, no one was killed. Since then, she has kept a more circumspect relationship with wild cats (ya think? ), though from the book it is unclear whether or not she still allows them in the house. Still, she doesn't exactly dwell on that period in her life. After all, it's hard to raise money for a non-profit when you're also known for making astoundingly irresponsible choices, like inviting lions into your kitchen to rummage around in the fridge or allowing them into your children's bedrooms to sleep with them. For her relentless screeds against Alfred Hitchcock, some fans of the director have privately hinted that maybe she's going a little loopy in her old age. But the fact is, poor judgment reared its leonine head while she was in her prime, complicating the stories about her past that Tippi is fond of telling. Stay tuned. Thanks to Elisabeth Karlin and Zak Zebrowski for bringing these pics to my attention. I laughed out loud when I read that exchange in the New York Times yesterday. Thanks for providing more information about Tippi and the lions. I knew she had this "lion" fetish, but I never thought she went this bananas Tippi in my view was an appallingly irresponsible parent. Tippi is lucky she survived this period in her life with her family (and her head) still attached. I was the girlfriend to Jerry Marshall. We spent a lot of time with Tippi and at Shambala preserve. One of our first dates was at Shambala. Jerry had me feed one of the Tigers by hand. To me,the intent of the preserve always seemed shifty. Jerry used to tell me the whole thing was for publicity-- to keep Tippi in the limelight.. but sheesh, most of hers and Noel's kids were nearly killed. I think they were all a stupid bunch of drunks. Thanks, Laura, for that background. (I've added it to the Hitchcock Geek Facebook wall as well.) This story needs to be told! I've always found it incredibly hypocritical of Tippi Hedren to whine about how she was treated on The Birds (having live birds tossed at her off-camera) and yet, what she did on the set of "Roar" was far worse. Putting humans, either crew or cast members, next to man-eating lions was the height of irresponsibility. Many crew members were horribly injured during the filming (a secret I'm sure TH wouldn't want to get out) and yes, I believe the woman who said that the preserve was really to preserve TH in the limelight. When that failed, she was always reduced to repeating her "Hitch fondled me" stories which of course no other actress (and Hitch worked with a lot of them) never corroborated with their own stories about him. It was only Tippi who, I believe, attacked AH post-mortem (conveniently when he couldn't defend himself) making these outrageous claims as another way of keeping herself in the public eye. Someone should do a movie about the making of Roar much like Tippi participated in the HBO hatchet job of Hitch.